Super Mario's dinosaur buddy Yoshi is back in an all-new egg-slinging adventure, but some players may find this crafted world to be just a little flimsy. Platforming video games have long followed a simple recipe: Run to the right of the screen, avoid oncoming enemies, and scoop up as many collectibles as possible. Super Mario World 2: Yoshi's Island put a spin on that basic formula by shining the spotlight on Mario's dinosaur sidekick Yoshi, who could swallow enemies and lay eggs that could be used as ammunition. This little tweak combined with the game's hand-drawn aesthetic made for an instant hit, but the sequels that followed weren't nearly as popular among players, perhaps because they were relegated to mobile and portable hardware. In many ways, Yoshi's Crafted World is an attempt to recapture the magic of Yoshi's Island. Built for a modern console with modern features, it has all of the relaxing gameplay and subtle charm series fans have been waiting to return to. Unfortunately, that signature style has since grown dated, and by playing through Yoshi's Crafted World, it's easy to see why. Like with Yoshi's Island, Yoshi's Crafted World banks on an aesthetic theme that forms the foundation of the world. In this case, the world is crafted — specifically by use of cardboard. Everything that can be seen or interacted with in the environment is crafted with cardboard or other recyclable materials, or digital versions of those things least, which coincidentally pairs nicely with the general theme of Nintendo's latest Labo releases. On the visual side, everything is wonderful: Worlds are full of detail, nearly everything in the environment can be interacted with in some way, and each of the models for objects or characters is rendered with pleasing fidelity. 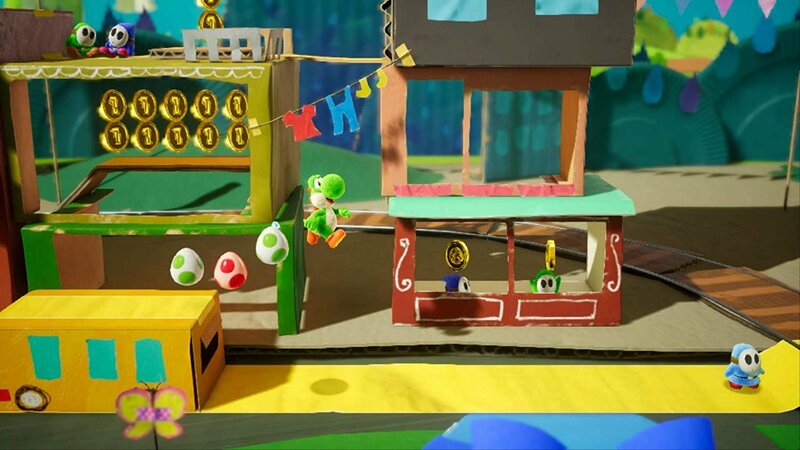 Yoshi's Crafted World is built around the Unreal engine, which makes for lovely graphics but feels strangely at odds with Crafted World's cardboard theme. Who else but Nintendo would get a hold of such powerful tech and use it to render pasteboard and other recyclables? Aiming and throwing eggs into the background and foreground is suprisingly fun. For general platforming fans, the big hook to Yoshi's Crafted World will likely rest in Yoshi's egg-slinging prowess. Eating certain enemies will cause Yoshi to lay eggs which he can then hurl at other enemies or objects spread across the environments. 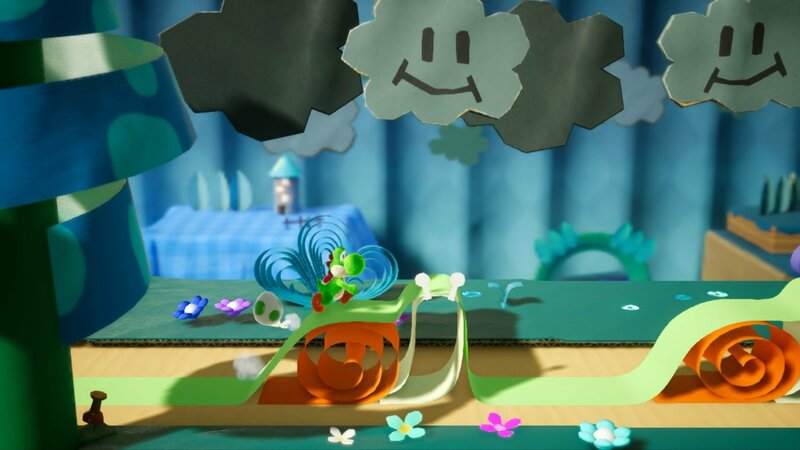 Unlike Yoshi's Island, however, this time around Yoshi can target objects in the foreground as well as the background. 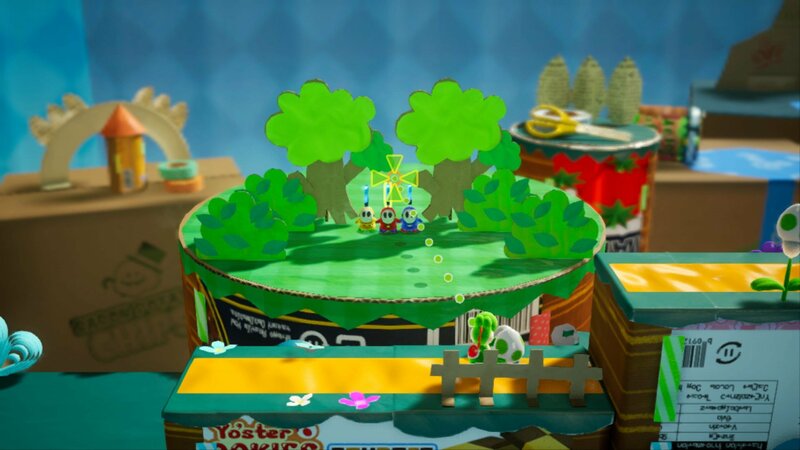 This extra bit of depth makes for a much more interactive world: Yoshi can knock over grass in the background for a few easy coins, snipe enemies in the foreground for collectibles, or even hit special clouds which will drop random goodies or maybe even flip the perspective 180 degrees and open up a timed arcade-style target-practice-like minigame. 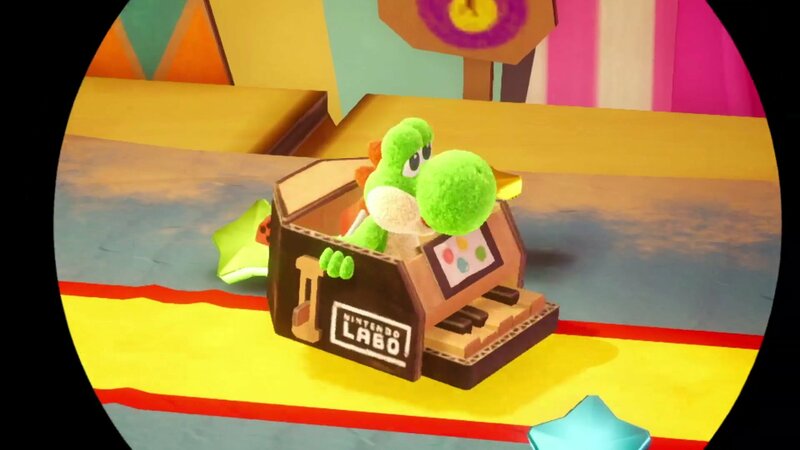 The ability to interact with stages beyond the immediate vicinity also allows for stages with malleable paths: At some points, Yoshi will be unable to progress until an object has been built, such as a train missing its wheels and carriage. Paths into and out of the foreground or background lead to areas where the objects can be found, and players can even assemble them in the background by tossing them just as they would toss eggs. Some cutscenes play out like a puppet show. 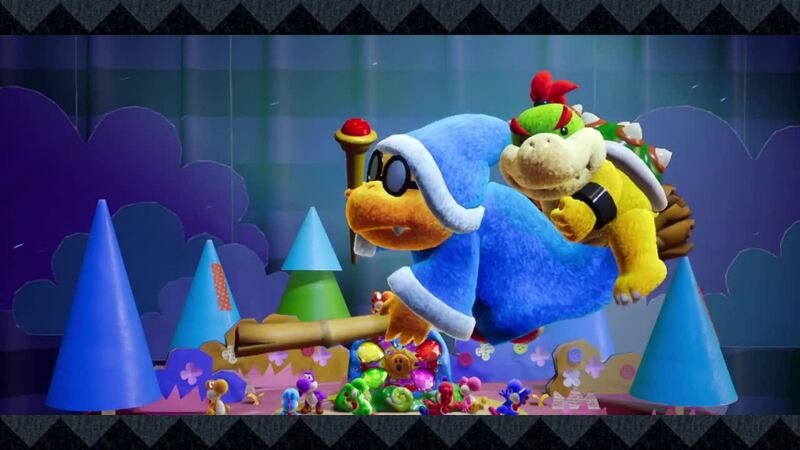 Beyond these changes, Yoshi's Crafted World feels like just about any other platformer. All players really need to do to win is to make it to the right side of the screen. Otherwise, the bulk of the game is about collectibles. At the game's start, Yoshi and his dinosaur buddies discover a set of crystals has gone missing, and must then seek them out to restore proper balance to their world. Along the way, they'll need to collect smiling flowers, which are spent at set intervals to open access to later areas. Aside from flowers, Yoshi also collects both gold and red coins: Collecting 20 red coins on any stage grants another flower, while Gold coins are used as currency to purchase new costumes. Like the rest of the world, these costumes are all made of cardboard, but they do at least serve to protect the hero dinosaur from incoming damage. Costumes are purchased through gumball machine-like contraptions in a process that feels remarkably similar to modern loot boxes — however, even though costumes are granted randomly, they are finite, and players are guaranteed access to all of them if they're able to drop enough coin. The Nintendo Labo inspiration is clear. To make matters worse, the game's soundtrack can be downright grating. Most of the tunes are sort of cutesy and forgettable, but others are just bad — almost like the composer specifically chose dissonant notes, chords, or out-of-tune instruments. Considering that many levels are played several times through — oftentimes in reverse to find different collectibles or to set a new record time — the audio soon begins to move from uncomfortable toward upsetting. A lot of the fancier additions are hit-or-miss, too. Some levels have unique items like magnets or mine carts that can be used to reach new areas, but others — like one where the player pilots a massive, mechanical punching Yoshi — fall so flat that I'm not convinced anyone would find them to be fun. Google defines cardboard as "lacking depth and realism; artificial," and that definition certainly feels true-to-form here. Yoshi's Crafted World has all of the components of a classic platformer game, but the entire experience just feels shallow. There's no doubt that children will have fun with it, and longtime Nintendo fans will jump on the chance for another strong dose of nostalgia, but there's not much to satisfy modern-era gamers otherwise. This review is based on a Nintendo Switch download code provided by the publisher. Yoshi's Crafted Story is available in retail and digital stores on March 29, 2019. Thank you for a great review. You take the time to explain, in-detail, each hiccups you found in the game and explained exactly why you thought the game would have had better without giving too many spoiler-y details away. Judging from its story trailer, I kinda found its art style quite charming. It feels like the game is solely intended to give joy to young gamers. Lastly, <a href="https://ogreatgames.com/?749">just like other Yoshi games</a>, this game seems to only pose a challenge in terms of getting to 100% complete it.